Enclosed cork bulletin boards, also known as cork boards with locking doors are essential for schools, businesses, churches and communities. Important messages, pictures, posters, fliers, newspapers and other related information can be pinned on the boards and displayed to the public. These fully surrounded bulletin boards come with various designs of message boards that fit all your needs. Enclosed cork board are decorative and professional and the indoor / outdoor pinboards feature swing open doors with aluminum frames. These indoor/outdoor cork cabinets come with single swing door and swinging two/three doors. This cork display cabinet with aluminum frames are strong and built to last long. These enclosed bulletin boards, including framed cork cabinets and swing doors message boards, also feature acrylic doors in order to protect important information. 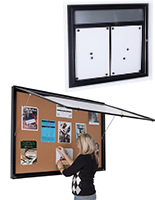 These enclosed bulletin boards are great for preventing damages from weather and other unexpected reasons. These wood & aluminum notice boards are convenient to put on any wall as customers prefer because of their small size and light weight. These enclosed bulletin boards can be placed on the wall inside of buildings and outdoors for displaying messages. These large cork boards are often used on classroom walls and in school hallways for delivering messages to students and the public. These natural oak framed cork bulletin boards are the perfect choices for indoor/outdoor message display. Theses pinboards liven up the class and make your business look more professional. Outdoor single swing door cabinet that illuminates is necessary for displaying messages at nighttime and it is an effective way to capture the attention of passersby in daytime. What features come with these enclosed message boards? 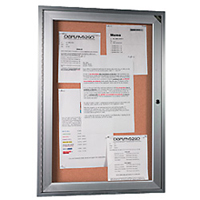 These enclosed bulletin boards feature high quality frames that make of aluminum and wood. These corkboards have swing open doors that make it easy to use. These indoor/outdoor display cabinets come with weather proof feature that can protect the important information rain, snow, wind and other unpredicted weathers. Aluminum frame cabinets with locks are effective tools to protect messages from being stolen or damages. This enclosed cork board features a illuminate swing frame. There is an energy-saving LED light bulb concealed inside of the cabinet. 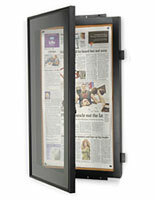 These display wall mounts feature weather proof corner design that protects inside materials and LED lights. These cork bulletin boards come with all the installation hardware, push pins you need, and keys to the lock of the cabinet. Large selection of size choices can work best with your business needs. 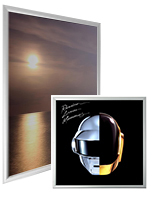 These enclosed cork boards are a great addition to showoff and protect your messages. We offer wood framed presentation boards such the oak, the walnut and the wood finish swinging frames. 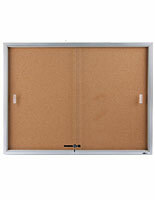 In addition to our wood cork boards, we have satin aluminum boards and the metal finish swinging frame. There are a large bulletin board selection offered in this site. Our selection includes classic corkboards, display combination boards, outdoor corkboards, dry erase markerboards and various letterboards. 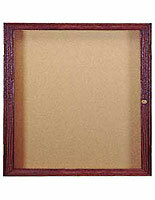 Additionally, our collection includes presentation easels in many styles and sizes.